Libya continues to be in a state of turmoil since unrest broke out in 2014, leaving 1.15 million people in need of humanitarian assistance. Access to basic goods and services has become a challenge, as many households are faced with decreasing purchasing power and a lack of access to cash. To assist vulnerable households, aid organisations have been scaling up cash-based interventions across the country. To support such interventions, REACH and the Libya Cash & Markets Working Group (CMWG) have been implementing the Joint Market Monitoring Initiative (JMMI) since June 2017. The key objective of the JMMI is to inform cash-based responses by providing information on market functionality and price trends. In key urban areas across Libya, field teams record prices and availability of basic food and non-food items (NFIs) sold in local shops. 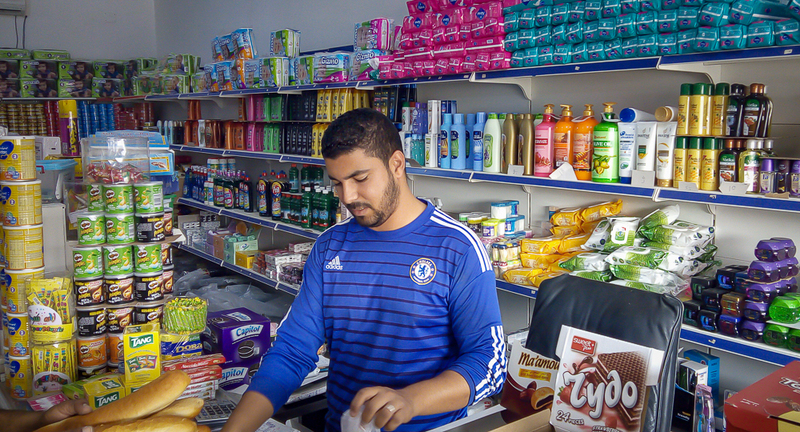 In December, 257 shops in 24 urban hubs across Libya were surveyed in the monthly assessment. The initiative is structured as a collaborative partnership between CMWG members, with REACH centralising the data, providing analysis and publishing monthly outputs. The JMMI June–December 2017 Trends Analysis presents a longitudinal analysis of price data collected since the start of the initiative. It found that basic food and non-food commodities have become costlier in Libya from June to December 2017: Food prices rose by 16.9%, while the prices of non-food items increased by 4.1%. The price increases are primarily due to the depreciation of the Libyan dinar on the parallel market, which has been driving import costs upwards. Over the last 7 rounds of JMMI data collection, all assessed food and non-food items were generally readily available in all locations. Shortages of some basic commodities, however, were observed in Derna, where the tightening of the military encirclement led to a disruption of supply chains. The price inflation directly affects vulnerable households as it further reduces their purchasing power. Humanitarian actors engaged in cash-based interventions should take these price hikes into account and regularly adjust the size of cash transfers to beneficiaries of cash distributions. The fact that all monitored commodities were generally available suggests that supply chains are functioning and able to provide goods to markets continuously — an indicator of overall market functionality. The CMWG therefore recommends to keep prioritizing cash-based interventions. Access the JMMI June-December Trends Analysis report at the following link. Find the JMMI February factsheet at the following link.